Sunset Beach bed and breakfast travel guide for romantic, historic and adventure b&b's. 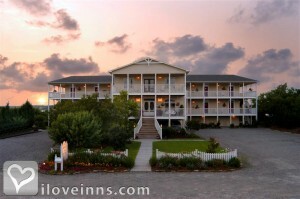 Browse through the iLoveInns.com database of Sunset Beach, North Carolina bed and breakfasts and country inns to find detailed listings that include room rates, special deals and area activities. You can click on the 'check rates and availability' button to contact the innkeeper. Sunset Beach, North Carolina has one of the most beautiful beaches in the state. Golf courses include Tiger's Golf Links, Heather Glen Waterway Golf, Lockwood Folly Country Club, and Farmstead Golf Links. Cooter Creek Paddlesports, Dixie Stampede, Barefoot Landing, Ingram Planetarium, and Big M Casino are some spots visitors enjoy. Being a coastal town, Sunset Beach offers deep-sea fishing. Visitors can choose any of the charters operating here such as Cap'n Hook Outdoors and Ocean Isle Fishing Center. To arrange trips with ask the help of innkeepers at Sunset Beach bed and breakfast inns. By Sunset Inn.